Pure white beaches of soft, velvety sand, waters of a thousand shades of blue, soaring golden cliffs and, framing it all, the deep greens of laurel, myrtle and juniper. The Mediterranean coastline is jawdropping anywhere from Spain to Greece and Italy is no exception. What really sets the Bel Paese apart, however, are the many picturesque villages lapped by the sea or perched high on the hills above it. These places marry the magic of Italy—Roman ruins and medieval castles, colourful fishermen’s homes and grand Art Nouveau mansions, aperitifs under the stars and romantic restaurants serving fresh fish—with the scenic beauty of dramatic, sun-flooded waterscapes. And there are plenty of villages to choose from, each with its own appeal. Think Portofino, Capri, Panarea or Positano for a touch of society life, the Cinque Terre for extraordinary walks between sea and mountain, Cefalù for mighty Aragonese architecture, Scilla for its link with Greek mythology and the sense of being at the crossroads between two worlds. 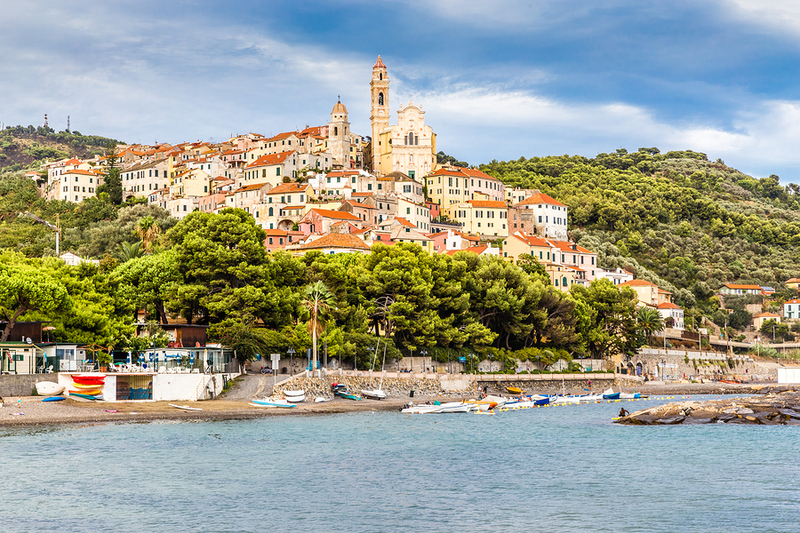 But if you prefer smaller villages that may not have the same international renown as Portofino and Capri, but are nonetheless arrestingly beautiful, make sure to visit those in our selection—when it comes to waterside havens, Cervo, Giglio Castello and Castelsardo are among Italy’s very best. The sea on one side and woods of olive and pine trees on the other. Cervo, in Liguria, is ringed by nature. 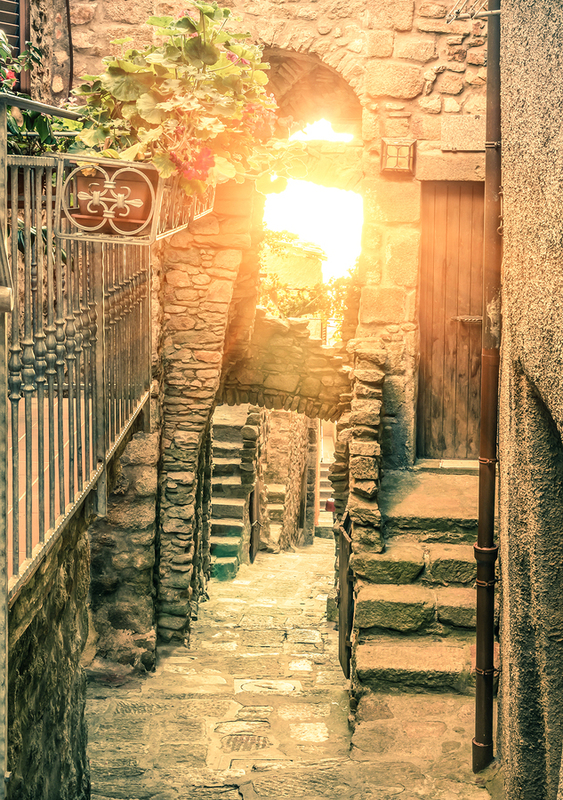 But the ancient cobbled alleyways that make up the village are the picturesque byproduct of medieval ingenuity. Arched gates open into the thick 16th century walls leading to a place where time stood still. Cervo’s steep narrow streets, which are only accessible on foot, are lined with china, glass, wood and leather workshops and pastel-hued houses, often covered by climbers or bright pink bounganvillea. Every now and again, grand palazzos—built by the village notables in the 18th century—break up the medieval architecture. These two souls of Cervo’s—medieval and Baroque—are encapsulated by its two most precious monuments, the medieval castle once belonging to the Clavesana Marquis (now converted into an exhibition centre) and the church of San Giovanni Battista, with its opulent, unusually concave façade. But Cervo itself has another nickname—it is known as the village of music. This is because it is the backdrop to many musical events and festival including one (the Festival Internazionale di Musica da Camera) which has been running for more than forty years. That said, Cervo could equally be dubbed ‘olive village’ for its excellent Taggiasca olives, and the cold pressed oil and pate made with them. The beaches alone are worth a trip to the Isola del Giglio, an islet just off the Tuscan coast. For the second year in a row, Giglio has been awarded the top accolade in the Guida Blu, a review of Italy’s best beaches published by the Italian Touring Club in association with environment protection body Legambiente, for both the sheer beauty of the place and the local efforts to preserve it intact and eco-friendly. On the hills above one of the Guida Blu’s recommended beaches, Arenella, stands Giglio Castello, a 12th century borgo, renovated by the Medici in the 16th century and untouched ever since. Encased by thick stone walls peppered with bulky towers, the village is an intricate maze of narrow alleys, often topped by soaring arches, which every now and then frame views of jagged rocks, golden sand and turquoise sea in the distance. The ancient houses that line the streets—taupe under brick red roofs—still have the flower-strewn balzuoli, external staircases that used to link floor to floor in olden times. Above them all stands the massive bulk of the Rocca Aldobrandesca, an imposing fortress perched at the top of a rocky outcrop. Built in the early Middle Ages, it was initially a religious building, but the Aldobrandi family turned it into a castle. As the island changed hands from the Aldobrandi to Pisa to the Medici, so did the fortress but all along it kept its defensive function—particularly since the island was a favourite target for Muslim pirates. The interiors are not open to the public but a tour around the forbidding façade is well worth your time. Equally fascunating are the many medieval cellars carved in the basement of the old village houses, where you can sample a strong local wine, the Ansonaco. Before leaving Giglio Castello, don’t forget to take a walk along the Franco promontory (for holm oaks, cyclamens and strawberry trees) or dive at Le Scole to see the lovely red gorgonian. Like a finger pointing towards north-west, the promontory of Castelsardo stretches green into the turquoise Golfo dell’Asinara. The village stands at the very top of the promontory, a cluster of ancient houses sheltered by massive walls and seventeen towers. Once a centre of Sardinia’s prehistoric civilisations—there are megalitic walls just outside it at Monte Ossoni, a nuraghe tower near Sedini, and a subterranean domus de janas necropolis at San Giovanni—it later became a Roman port. However, it really started flourishing in the Middle Ages, when a notable Genoese family, the Doria, chose it as its Sardinian seat. They named it Castelgenovese (Genoese castle) and built both their power base and an impregnable fortress here. One of the family’s most notable scions, Brancaleone Doria, married Eleonora, a Sardinian princess, and the couple spent many years in the village. But then Eleonora became queen, inheriting from her father both the kingdom of Arborea and the century-long war against the Aragonese. The hostilities ended with the Aragonese side winning the war, and Castelgenovese changed hands and name in the 15th century, becoming Castell’Aragonese (Aragonese castle), a royal town. Centuries later, the Piedmontese acquired Sardinia from Spain (via Austria and the treaty of Utrecht) and Castell’Aragonese got renamed Castelsardo. Despite the many changes of rulers and epithets, however, the village has preserved its medieval essence over time. Dozens of narrow streets and steep steps climb up the hill towards the Doria castle, offering glimpses of turquoise, azure and aqua waters from the gaps between tall ancient houses. 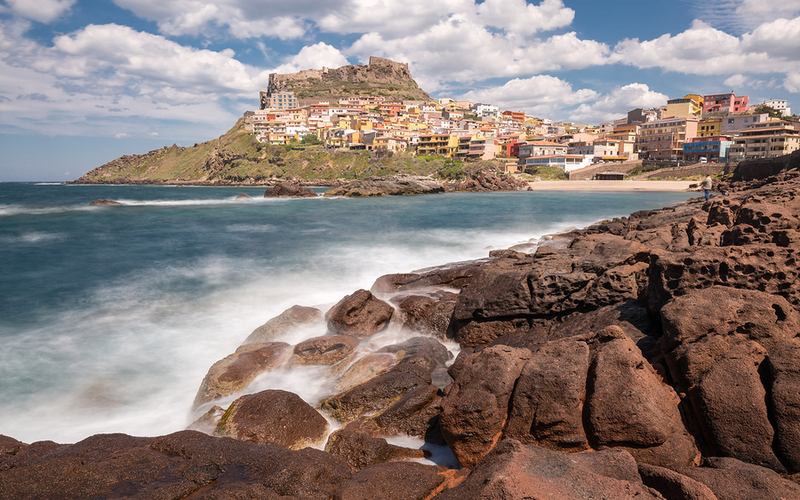 The forbidding castle is now a museum of Mediterranean basket weaving—an art that is still alive in Castelsardo. Art of a more formal kind is also on offer in the Cathedral of Saint Anthony, which is immediately visible from any corner of the village thanks to its majolica tiled belfry. The church houses a retable by the Maestro di Castelsardo, one of Sardinia’s foremost Renaissance painters. But visitors with a more profane bent will be equally interested in visiting the village’s many seafood restaurants, which serve up spaghetti with sea urchins or lobster. And if you need to chill out after a good meal, the best beaches are at Lu Bagnu (a mix of rock and sand) and the red-hued Isola Rossa.